A fellow of infinite jest, indeed. Their upcoming production, John’s play From Denmark with Love (opening May 10, 2013 at Boston Playwrights’ Theatre), certainly fits the bill. 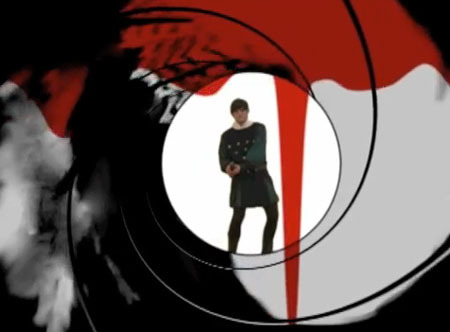 From Denmark with Love is a comic mash-up of James Bond and Hamlet, and here, John shares the irreverent play’s origins, its playlist, and his post MI6-adventures. How did inspiration strike for From Denmark with Love? In fall 2011 Whistler in the Dark was performing Dogg’s Hamlet/Cahoot’s Macbeth and asked five companies to each adapt an act of Hamlet for a one-off evening called Something Rotten. Vaquero Playground was assigned Act II. Around the same time, both of my grandparents passed away and I went to the funeral. I read Act II on the flight back from that, with thoughts and memories of them pounding on my head. My earliest cinematic memory is of seeing the ninjas invade the volcano base at the end of You Only Live Twice, watching a Bond marathon with my grandpa. Act II of Hamlet is totally a spy adventure! Everyone spying on each other: Polonius sends spies after Laertes at school; Ophelia reports to her father on Hamlet’s behavior; Claudius sends Rosencrantz and Guildenstern to spy on Hamlet; Hamlet sets up the Players to suss out Claudius’ guilt. What do you hope to see in the local new play community’s future? Less focus on good writing, more focus on good stories. I think we spend too much development on writing stories that small audiences care about. Won’t work. Do you secretly dream of being a) a pop icon, b) an algebra teacher, and/or c) a crime-solver/writer a la Jessica Fletcher? I want to be a pop icon who solves crimes. Honestly if I could be Sherlock Holmes, I’d be pretty happy. If forced to choose, would you be a magic marker, a crayon, or a #2 pencil? I make a playlist for every play I write (and have separate playlists for dancing and painting). Once I have an outline or idea for the arc of the story, I try to find songs/create a playlist that emotionally follows that same arc and listen to it constantly. I don’t think I could write without music! For Denmark it was less about the story arc and more about the style. And Bond obviously has a wealth of music to pull from. I also used a lot of music from other spy movies or similar action/thrillers like Ocean’s Eleven. You can check out my playlist on Spotify: From Denmark With Love – Writer’s Playlist. Blazing Saddles, Three Amigos, Jaws, The Dictator (anything by Chaplin), Children of Men, Fight Club, Dr. Strangelove, Cabaret, An American In Paris, La Dolce Vita. And in the case of Denmark: EVERY SINGLE BOND MOVIE. Currently writing a (very loose) adaptation of Huckleberry Finn set in Massachusetts and circling around Gay Rights and gender/sexuality, rather than race. Also: writing a lot more music. I just wrote a lot of music for Lunar Labyrinth with Liars and Believers, based on a story by Neil Gaiman, and that was a blast. I’d like to do more of that. From Denmark with Love will be performed May 10 – June 1, 2013 at Boston Playwrights’ Theatre. All tickets $10 or less. John J King is the Managing Artistic Director and Senior Mirth Strategist for Vaquero Playground. 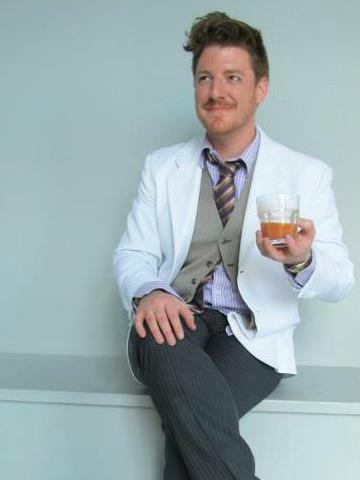 JJK is a boston-based playwright | musician | painter | director. He makes fun things that incite wonder and delight. He believes in simplicity and silliness. Goals include writing a great dance tune, inspiring strangers to laugh with one another, making impossible things out of cardboard, and singing in a girl group.